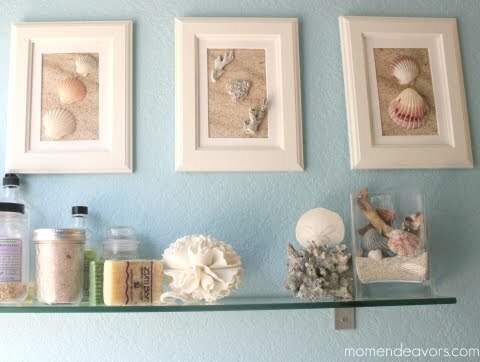 Ideas how to arrange your collected treasures in frames, so you can enjoy them as shell art. Grouping of deep shadow box frames comes from Craftberry Bush. When composing your shell art there are three things to consider. The frame, background and arrangement of shells. To bring them together, all you need is your imagination and a hot glue gun. A compelling assortment of small Coquina shells from Sanibel Island, FL. Featured on Displays Inspired by the Natural History Museum. The shells are also known as butterfly shells. It's easy to see why. Each shell has its own pencil drawn compartment. An inexpensive white Ribba frame from Ikea was used. 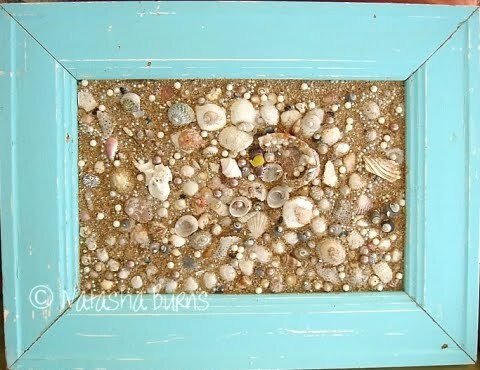 The idea of a Beach Collage is a little different from all the other shell art projects. It's like framing a slice of beach. By Natasha Burns. 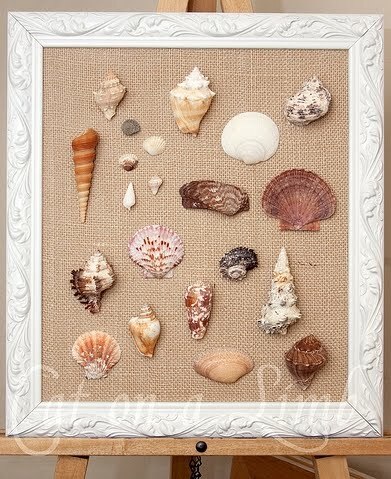 For this Framed Shell Art a recycled frame was used and burlap as a background (hot glued to a cardboard) which gives this framed shell wall art a sandy feel. Also note, there is no glass. You can touch the shells. And a very useful tip: Lay out the shells then take a picture so you remember the placement. 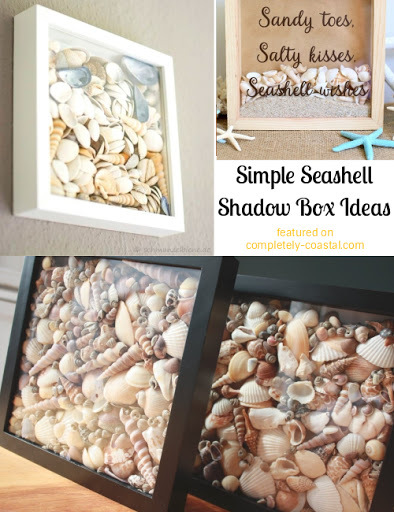 Fill a Shadow Box with your Seashells. Easy to pull off, and striking in look. A deep enough shadow box can also be displayed free standing. Create abstract shell art. 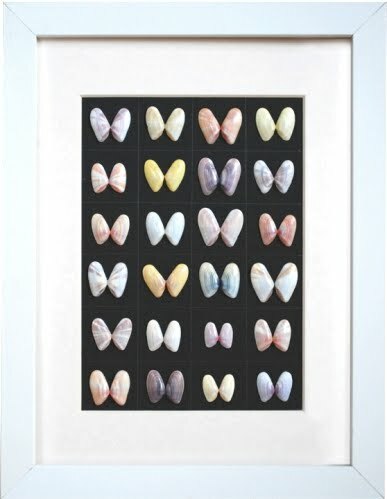 Featured on Gallery Worthy Framing Ideas for Shells, Seaglass and Beach Pebbles. By Beached Art. 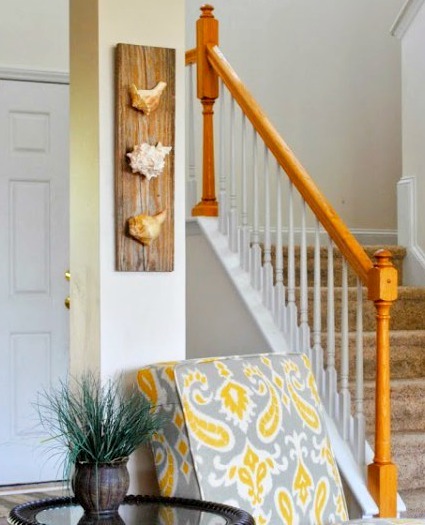 Mount Seashells on Wood for a casual rustic look. Original source unknown. With a wood board as frame you can create anything. 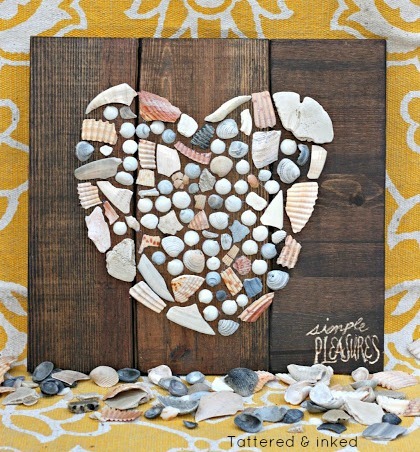 By Tattered & Inked, featured on DIY Seashell Hearts Wall Art. Black makes for a dramatic background. In this case a black velour fabric covers a sturdy foam core board. Via My Pinterest. 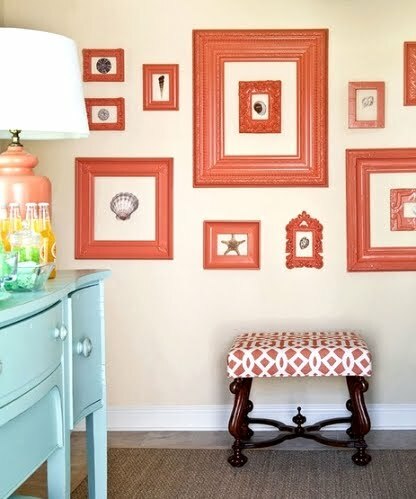 An outstanding Gallery Walls of shell art in a dining room via Traditional Home, featured on Slipcovered Furniture 101. 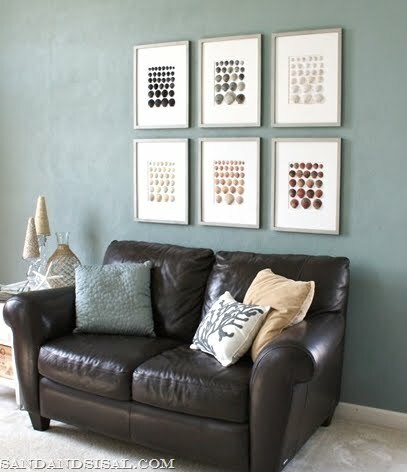 For tips and tricks, read How to Hang a Picture Grouping. 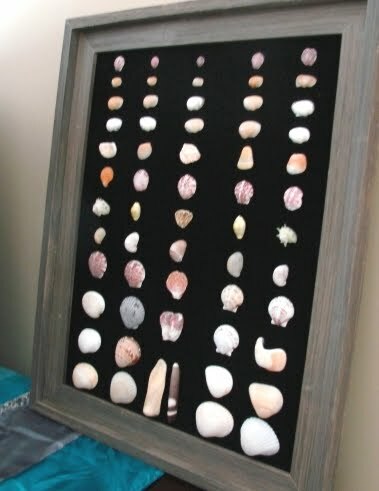 Shadow Box frames were used to play off the shell pattern in a Dash & Albert seashell rug, featured on Nautical Rugs. Via Redbook Mag. Shell Art in the Bathroom. Pieces of beach vacation memorabilia. Shells arranged by color and size. By Sand and Sisal. A bunch of frames unified with paint, each displaying a single shell. By Tobi Fairley. via Traditional Home.